Ergonomically designed chairs have come a long way, and the Ray Modern High Back chair is further proof of just how far. This chair is contemporarily designed and features an intuitive self-weighing mechanism that automatically adjusts the tilt tension to meet the needs of every user who sits in it. This feature, coupled with thick foam padding on the seat, backrest, and full headrest provides exceptional seating comfort. 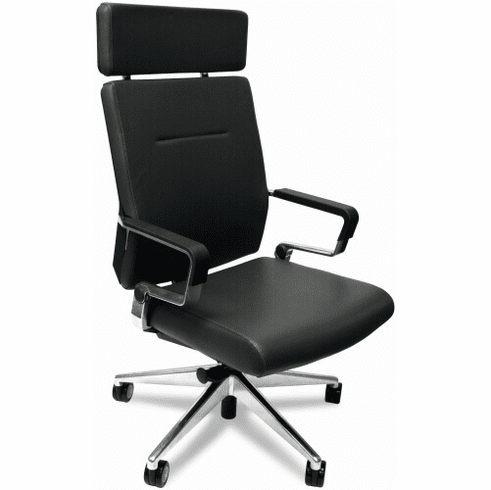 This chair also has seat height adjustments, tilt lock, a full 360 turning radius, and full loop arms to provide the most ideal sitting position. The chair also has a nylon angled five star base and carpet casters with dual wheels that are rated for up to 325 pounds. Normally ships within 15 business days from Toronto Canada.